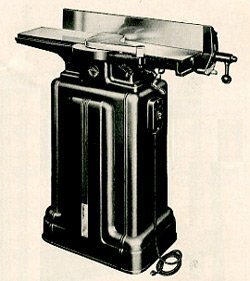 The Delta Jointer 6" Model No. 37-205 on a cast iron stand was a wood shop main stay. Every type of woodworking shop had a use for a number of these efficient jointers. Heavy, rugged and extremely accurate, they were light enough to be portable so that they could be moved to where needed at a moments notice. Early Delta Jointers were exceptionally heavy, rigid units cast of close-grained iron and accurately machined to close tolerances. The tables were not only ground flat and true individually, but they were ground a second time after being assembled on the base so that there was no chance of misalignment. Front and rear tables were individually controlled by readily accessible control handles, and gibs are provided on the dovetailed ways to take up wear. That's why so many of these old Delta jointers are still found in woodshops all over. Also see Delta Jointers For Sale. The Delta jointer fence with its ground face is rigid and its double tilting adjustable stops at 45, 90 and 135 degree angles insure the fence being returned to its originally accurate setting, once the stop screws are accurately set. The dual control handle was an exceptionally convenient feature. Unfortunately this handle is missing on many vintage machines. When the dual control handle is pulled out it engages the bracket lock nut, which when loosened frees the entire fence so that it can be moved across the table to any position desired. Tightening the nut, clamps the fence firmly and accurately in position. 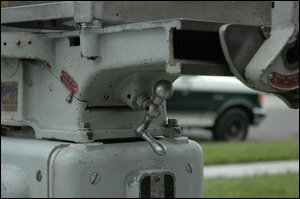 When the dual control handle is pushed in it engages the tilting lock nut. A twist of the nut loosens the quadrant so that the fence may be tilted to any angle desired. Tightening the nut locks the fence. When the handle is not engaged it sings free, out of the way. A touch of the finger moves the patented stop links into or out of engagement with the individually adjustable stop set screws enabling the fence to be accurately stopped at 45, 90 or 135 degrees. The fence can be set accurately for other angles by means of a large tilt scale. To insure absolute accuracy when tilting the fence the top screws are individually adjustable. This is another Delta patented feature that is often imitated on lesser machines. Once the stops are set, the fence will always return to its setting. There are also convenient scales on the table and fence to make accurate settings easy. The front safety guard provides protection for the user against the actions of the cutting knives and head. The quality features of this Delta Jointer 6-inch machine and the durability of the materials and manufacturing are testaments as to why this machine has been the standard 6-inch jointer for shops of all types. 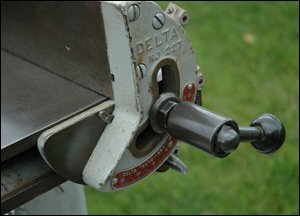 The 6-inch Delta Jointer cuts rabbets a full 1/2" deep and can be made in one pass of the work, although that isn't recommended. The guard is instantly removed for rabbeting and as quickly replaced. If one peers at the underside of the tables, you'll see the rigid construction of the husky base casting and the dovetailed ways. The convenient ball-crank handle allows the front table to be raised and lowered easily and quickly. 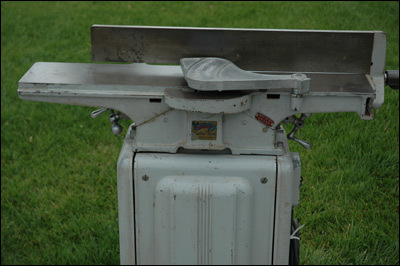 The scale at the side shows the depth of ut which is a maximum of 1/2" on the 6" jointer. Complete 6" Delta Jointer unit on Cast iron Stand consisting of 6" jointer with 3 High-Speed Steel knives, 2-way Fence with Dual Control, 2 3/4" Arbor Pulley, Front SAfety Guard, V-Belt, 7" Motor Pulley and Cast Iron Stand. 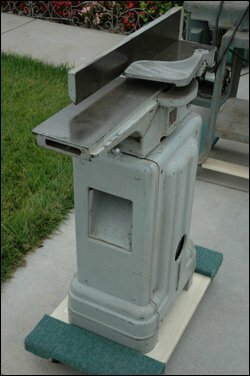 Delta 6 Inch Jointer Model No. 37-205 or 37-207 Manual (Pdf) Click to download PDF file. No. 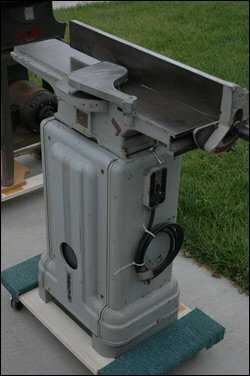 654 - 6" Jointer with 3 High-Speed Steel knives, 2-way Fence with Dual Control, 2 3/4" Arbor Pulley and Front Safety Guard. Capacitor start, 115v., 1725 r.p.m., 1/2" diameter single shaft, ball bearing. With switch, cord and plug. Light Duty: 60-310 - 1/3 H.P. Split Phase, 115 v.
Medium Duty: 62-110 1/3 H.P. Capacitor Start, 115/230 v.
Heavy Duty: 62-610 1/2 H.P. Capacitor Start, 115/230 v.
No. 656 Open Steel Stand, top, 8" x 15 7/8" x 29 1/8" High. No. 560 V-Belt - 56 5/16" INs. Cir., 58 1/8" Out. Cir. Maximum width of boards... 6"
Maximum depth of rabbet cut... 1/2"